If you have disabled travelers in your group, choose Morgan's Wonderland instead, a theme park built for people of all abilities. San Antonio is one of Texas' most thrilling cities when it comes to adventure, and this 4-day itinerary is proof! Your group is going to enjoy major San Antonio attractions, experiences, and recreation options that we know you are going to love! This beautiful riverway is lined with businesses, restaurants, hotels, attractions, and other services to make it the most inviting and entertaining district in the city. Boutiques and shops are sprinkled throughout the walk, spicing up the area with specialty shops and local flavor. Nearby is the Rivercenter Mall for more in-depth shopping, located only minutes away. Other attractions include the Majestic Theatre where you can see all manner of performances and various special events that take place throughout the year. Dine by the riverside or in the air-conditioned venues to the sound of live music as friendly waitstaff serve up the most delicious cuisine from all over the world. Try La Paloma Riverwalk for fine dining, Boudro’s Texas Bistro for a classic favorite, or Michelino’s for traditional Italian cuisine. Arguably the most popular attraction in all of San Antonio, the Tower of the Americas is a must-visit for your group. This 750-foot icon located downtown holds an observation deck, revolving restaurant, bar, and even a 4D Adventure Ride (Skies over Texas). See Flags Over Texas on the observation deck, this platform level providing the absolute most stunning view of the city. Head to Chart House for some seriously legendary dining with unbeatable views, or grab a cocktail at Bar 601: Happy Hour. The Tower Cafe and Gift Shop are located on the same level as the observation deck, and you can also begin self-guided tours of the tower here, just make sure you see all the Texas historic murals while exploring! From team building exercises to group fun days, the Don Strange Adventure experience is one that shouldn’t be missed by any group desiring a fun, exciting day in the outdoors. Regular zip line courses for general adventures average at 350 to 400 feet in length at varying heights. Get a short briefing from the staff and then you’re on your way to the many wooden platforms before you shoot off through the Texas woods high above the ground. Team building adventures last approximately four hours and include rope courses either low or high or even both depending on your preferences. Group fun days make the Don Strange Ranch the perfect destination for groups of any size. Start off with zip line courses or take the Adventure Challenge course, do some catch and release fishing, have a chili cook-off, compete in the Cowboy Olympics or armadillo races, feed the longhorn cattle, and watch a live rodeo all on the Don Strange Ranch. With Mission Adventure Tours your group can spend the afternoon kayaking the San Antonio River, more specifically, the King William Paddle Trail section of the river. Your 2-mile guided kayak trip will show you the history of the area/waterway, as well as show you a great time as you paddle through the mostly flat riverway. The trip will last about an hour and will also show you spectacular downtown San Antonio skyline views, and views of the popular German Mansions along the King Willliam section. Groups of 8-28 can go on a tour at once, so if your group is larger you may want to split up and have the other half head to the River Walk for some food and shopping, then switch. 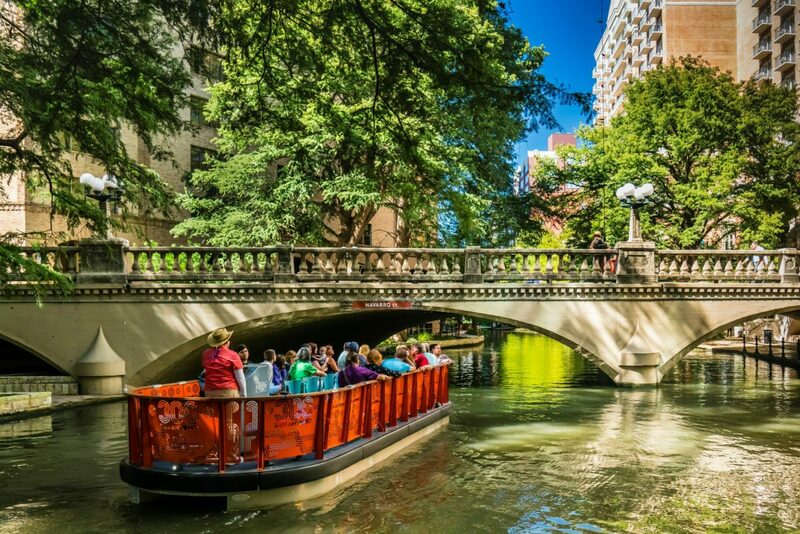 This dynamic and constantly evolving environment allows guests to 'eat, play, and learn along the banks of the San Antonio River', a perfect place for your group to explore and get to know the city a little better! While here you can do everything from learning to bake at french authentic Bakery Lorraine to enjoy live local events and concerts. There are fine dining options, places to shop for unique goods, and even a weekend farmer's market here! Culinarily speaking, Pearl District is one of the most cutting-edge places to visit. Here you will find the 3rd US campus of the Culinary Institute of America, as well as several different fresh and fine dining options along the way. Visit the Boiler House, Cured, or Chef John Brand's Supper. There are also several popular Pearl District breweries, as well as ice cream and coffee shops. San Antonio | The Saga is the free nighttime attraction located at San Antonio's Main Plaza, the 'captivating video art installation' displayed on the facade of the San Fernando Cathedral each Tuesday, Friday, Saturday, and Sunday nights at 9, 9:30, and 10 pm. ** This Grand Pinnacle Award-Winning display was created by renowned French artist Xavier De Richemont and works to narrate the historical discovery, settlement, and development of San Antonio, the nation's 7th largest city and one of the most pivotal locations in the story and identification of the United States and North America. The display totals to a 7,000 square foot projection with custom choreographed music in surround sound, the entire experience sure to captivate you with its beauty and historical content. The entire thing will last 24 spectacular minutes! In a park of world-class roller coasters, international cuisine, and thrilling waterpark rides, you can’t go wrong. Superman the ride features the world’s tallest vertical loop while Batman is the world’s first 4D free-fly coaster. If you’re brave enough to venture near these superhero worthy coasters, you deserve a cape of your own. Other crowd favorites include Der Twister which takes you on 360 degree flips at 4 Gs, the Poltergeist which rockets out of the gate going 0-60 in 3.5 seconds, the inverted coaster Goliath, and the Iron Rattler, a classic wooden style coaster that propels you up to 70 miles per hour on the turns. Take a break and go a bit slower on these classic rides. Try the themed carousel Amerigoround or Scooby Doo Ghostblaster where you can annihilate the ghosts with your own shooter. If you like waterparks, try the world’s tallest water slide, Bahama Blaster, or take a swim in the wave pool shaped like the state of Texas, Lone Star Lagoon, before heading on the White Water Canyon lazy river. Beautifully landscaped over 56 gorgeous acres of exhibits, gardens, and attractions, the San Antonio Zoo is as equally devoted to offering the public clean, comfortable enjoyment as they are dedicated to providing the highest standards of care for all living things. Housing one of the largest bird collections in the country, San Antonio Zoo is home to birds from all over the globe. See bananaquits mingle with Congo peacocks, Egyptian plovers, green aracaris, toucans, macaws, and a variety of North American birds including owls, hawks, eagles, and songbirds. Equally impressive are the reptile and amphibian centers where you can find poison dart frogs, Japanese giant salamanders, pythons, Armenian vipers, African bullfrogs, Mexican axolotl, and various dangerous creatures from jungles and deserts. Welcome to the iconic San Antonio Missions National Historic Park, one of the most historically educational, culturally insightful, and refreshingly entertaining sites you can visit with your student group while in San Antonio. This UNESCO World Heritage Site holds four out of five Spanish Frontier Missions in town, spanning nearly 300 years of rich history and culture. The four missions include San Jose, Conception, San Juan, and Espada. Each of these missions was actually historic communities in San Antonio that held the main church/religious focus, though many think they were churches primarily. Today they hold active Catholic Parishes and regular services for locals and guests, though they do not serve as communities as they once did. 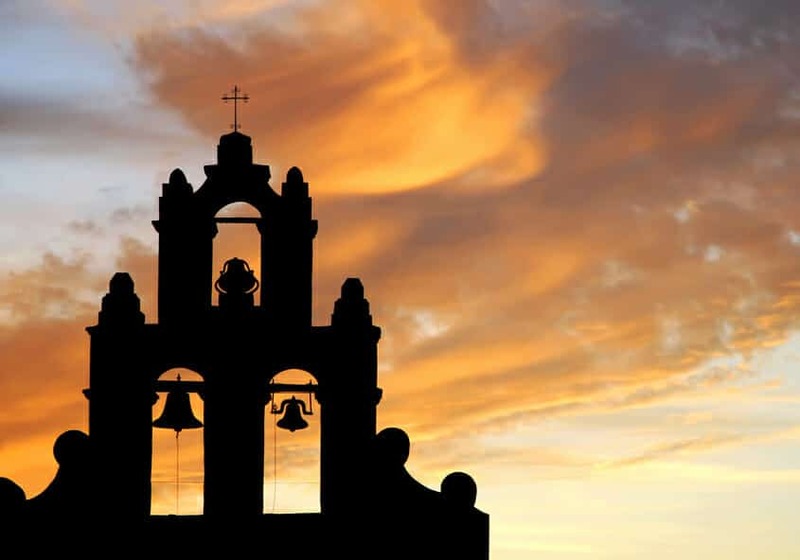 The bell tower of an historic spanish mission near San Antonio, Texas stands in peaceful silhouette against a beautiful sky at sunset or sunrise.